with a fascinating slice of history on the side. Australia - London telegraph line. One of the few signal tower sites still in existence, the Cape Schanck site was discovered only four years ago during historical research. Interpretive signage tells of its role and the development of the telegraph line from Tasmania through Victoria to the UK. To book, go to http://www.capeschancklighthouse.com.au/deals-and-specials and the 'Explore lunch deal at Box Stallion' link. 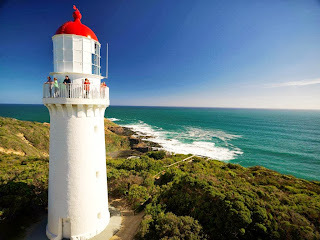 Cape Schanck was the second lighthouse built in Victoria. While its whale oil burners have long been replaced by kerosene and then electricity, the lighthouse boasts its original Fresnel lens and is one of the few operating as it did in the 1800s. Both Cape Schanck and Box Stallion are members of the Mornington Peninsula Attractions Pass, which includes seven of the Peninsula's top destinations. Costing $63 for adults and $45 for children, the pass delivers more than $100 of value and provides entry plus bonus offers at Ashcombe Maze and Lavender Gardens, Cape Schanck Lighthouse, Moonlit Sanctuary Wildlife Conservation Park and Peninsula Hot Springs. Searoad Ferries, Sunny Ridge Strawberry Farm and Box Stallion Winery all have a special 10% discount offer for pass holders. The Attractions Pass is transferrable, valid for three months and can be purchased online at www.emmp.net.au, at Ashcombe Maze and Lavender Gardens, Cape Schanck Lighthouse, Moonlit Sanctuary Wildlife Conservation Park, Peninsula Hot Springs and selected outlets on the Mornington Peninsula. The Mornington Peninsula is just an hour's easy drive from Melbourne or, for those travelling to or from the west of Melbourne or western Victoria, the ferry crossing from Queenscliff to Sorrento is only 40 minutes. Alternatively, take a return ferry trip and enjoy the spectacular bay experience.